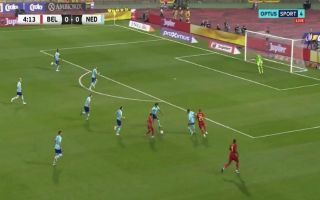 Dries Mertens put Belgium 1-0 up against the Netherlands on Tuesday night with a superb strike, following great work down the right from Eden Hazard. Chelsea’s talismanic winger picked the ball up in the centre of the pitch before beating three players on his way down the right flank and lofting the ball into the danger area, which was meekly cleared by Dutch defenders straight into the path of Napoli midfielder Mertens. The 31-year-old struck the ball perfectly on the bounce to fire into the top corner of the net, which gave Roberto Martinez’ men the best possible start in tonight’s heavyweight international clash.